Update March 13, 2017: Today indie publishers Devolver Digital announced a short delay for Strafe, an upcoming FPS filled with gibs, gore, and gratuitous violence. Originally slated for release in just a couple of weeks, it’s now been pushed back to May 9, presumably to add more of the red stuff. If it’s any good, we’ll put Strafe on either our best FPS games or best old games lists. We’re not sure. The news was announced in a republished trailer in which some NPC heads pop off, as you can see above. Original Story January 20, 2017: Sometime a couple of years ago you may remember a pretty brilliant trailer for some shooter or other, in which a child’s face literally melted because – according to his overbearing mother – he couldn’t “handle the intense gameplay”. Personally, I remember the trailer more than I do the game it was advertising. Turns out that game is called Strafe, and it just got a release date: March 28. Strafe’s advertising and aesthetics are stuck in 1996, a sepia-tinted, joyful time in PC gaming when the FPS and RTS reigned supreme. Half-Life was years away, though, and but for notable exceptions such as Dark Forces and Quake, shooters sometimes struggled to step out of Doom’s shadow. 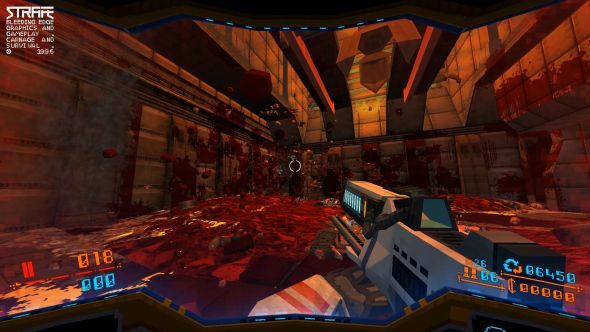 Against this backdrop, Strafe claims to be the most innovative shooter of 1996, and it may very have been; we’ll have to wait until it comes out. That’s an odd sentence. You’ll have over 30 weapons with which to kill over 20 bloodthirsty enemies, but you get only one life to do it: every game load creates a new and unique level, presumably using procedural generation. Gameplay is promised to be fast-paced, responsive, and full of gore. Strafe is on Steam here. You can’t pre-order it though – that would be far too noughties.